JOYFUL NOISE Opens January 13! Enter to Win Passes to the St. Louis Advance Screening! The small town of Pacashau, Georgia, has fallen on hard times, but the people are counting on the Divinity Church Choir to lift their spirits by winning the National Joyful Noise Competition. The choir has always known how to sing in harmony, but the discord between its two leading ladies now threatens to tear them apart. Their newly appointed director, Vi Rose Hill (Latifah), stubbornly wants to stick with their tried-and-true traditional style, while the fiery G.G. Sparrow (Parton) thinks tried-and-true translates to tired-and-old. Shaking things up even more is the arrival of G.G.’s rebellious grandson, Randy (Jeremy Jordan). Randy has an ear for music, but he also has an eye for Vi Rose’s beautiful and talented daughter, Olivia (Keke Palmer), and the sparks between the two teenagers are causing even more heat between G.G. and Vi Rose. If these two strong-willed women can overcome their differences and find a common voice, they–and their choir–may make the most joyful noise of all. Screening is Saturday, January 7th, 10am at the AMC Esquire. 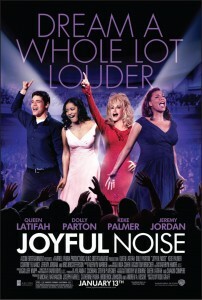 JOYFUL NOISE opens nationwide on January 13.